Budge Studios takes on Nickelodeon’s Dora the Explorer with this marvelous app that’s perfect for kids; especially fans of the show. 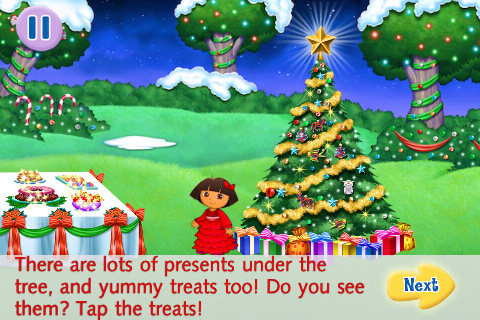 Using the backdrop of Christmas, Dora’s Christmas Carol Adventure for iPhone and Dora’s Christmas Carol Adventure HD for iPad helps improve reading skills, hand/eye coordination, color identification, and basic problem-solving. This app, which is part game, part interactive book, is constructed marvelously and is a tremendous value at under two dollars. Dora’s Christmas Carol Adventure tell the story of how Swiper the fox learned the meaning of Christmas and earned his way off of Santa’s “naughty” list. You can choose to have the story read aloud with the text highlighted along the way. Or, advanced readers can choose to turn off the audio and read on their own. As the story progresses, simple mini-games and puzzles are presented. They range from simply using your finger to uncover a hidden picture, to drawing a trail leading Dora to her destination. Later, players will be asked to search for a specific color. Combine these with the basic Spanish language teaching that the series is known for, and you’ll quickly find all the learning bases have been covered. Because this is an app aimed squarely at pre-K kids, it’s important for the interface to be easy and intuitive. Fortunately, Dora’s Christmas Carol Adventure excels in this department. The images are laid out clearly, with key points either highlighted or given a sparkle effect. Instructions are repeated in different ways should the user linger on the same page too long, giving younger users tips on what needs to be done in order to progress. 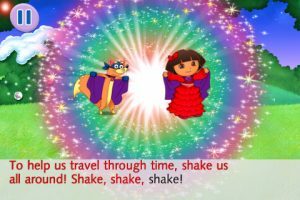 Little fans of the Dora the Explorer show will find familiar voices, characters, and imagery, giving them the sensation that they’re actually participating in an episode. Dora speaks directly to the user and frequently asks for help. It’s a great way for youngsters to get involved with the characters while learning basic skills and concepts. 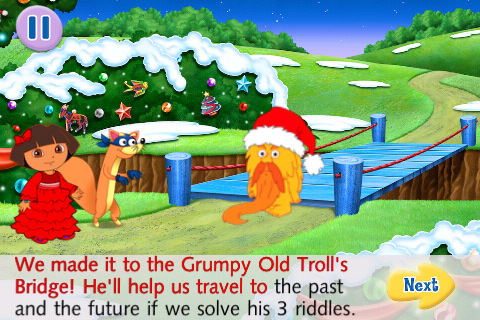 Bottom Line: Dora’s Christmas Carol Adventure is a great example of the iPad’s value as a learning tool for the younger set. It’s an app for kids that is executed perfectly. Dora’s Christmas Carol Adventure is compatible with iPhone, iPod touch, and iPad. Requires iOS 3.0 or later.